New stadiums: Quite some views from the US! From one of these stadiums you can admire the Rocky Mountains, while another gives you a panorama of the Atlantic Ocean. And it so happens that we now have 100+ US venues! 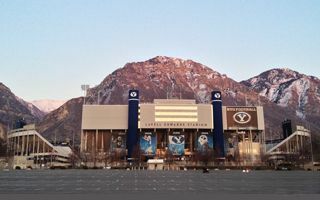 North of the campus and city, with Utah Lake in the west and Rocky Mountains in the east – in this precious location Brigham Young University opened their new football stadium in 1964. Initially the Cougars home ground had two grandstands along the sides and a running track. However, temporary additional seating was set up quickly to accommodate additional fans. So it was under 30,000 permanent seats and over 15,000 temporary in such layout. Huge changes came in 1982, when the running track was removed. This allowed the creation of 6 additional front rows between existing stands and the field. But more importantly, lack of curved track on both ends enabled erection of both end zones, which brought capacity to roughly 65,000. The stadium hadn’t grown since that time. Quite the opposite, it shrunk slightly with installation of club seating in the east and places for the disabled. What hasn’t changed is the tallest part of the stadium, the 10-storey main building with press box, which offers a spectacular view of the mountains. Until 2000 and for some to this day the stadium is commonly known as Cougars Stadium. But official name was changed to honour BYU Cougars legendary coach LaVell Edwards. Edwards became assistant coach at BYU back in 1962, before the stadium was even built. Since then he spent his entire career, 38 years, with the team. Plans of a new football stadium in Memphis were launched as an attempt to draw Liberty Bowl games to the city. That idea ended with success in 1965, when the ground opened. Initial seating layout was unusual, the bowl was much taller in the south-west, topped with a big press box. Steep stands and close proximity to the field gave the stadium recognition for sightlines. Capacity upon opening was some 50,0000 and the entire construction cost of under $4 million was recouped after just 16 sell-out games. And that with very reasonable tickets of $5-6. Since 1965 sell-outs were owed primarily to the Liberty Bowl and Memphis Tigers NCAA football. While there were numerous other tenants and one-off events, these two are the only ones present at the stadium since its opening. In 1987 the stadium went through its only expansion to date. The north-east side grew to match its greater “vis-à-vis”. One major exception is that instead of the press box, this one received a grander VIP building on top. On one side it neighbours the local airport, on the other it’s the northern entrance to Florida State University campus. The university’s new football venue was planned for opening already in 2010, but securing all funds took more time than initially planned. Eventually groundbreaking was shifted from 2009 to 2010 and enabled opening in fall of 2011. Worth $70 million, the building was designed by joint forces of HKS Architects and SchenkelShultz Architecture. They created a semi-open bowl with both southern corners left unoccupied. Semi-public plazas decorated by palm trees were created in these areas. In the future there is enough space on every side to expand, of course including the two corners. Capacity could be increased to 65,000 if needed. Until that time the entire structure is topped by the tall western main building. It comprises 56 boxes/suites and media facilities and the height allows visitors of the top floors to enjoy the view of the Atlantic Ocean. And since we’ve realized we’re already beyond the symbolic 100th stadium from USA, here’s a map marking the occasion with locations of all of them!